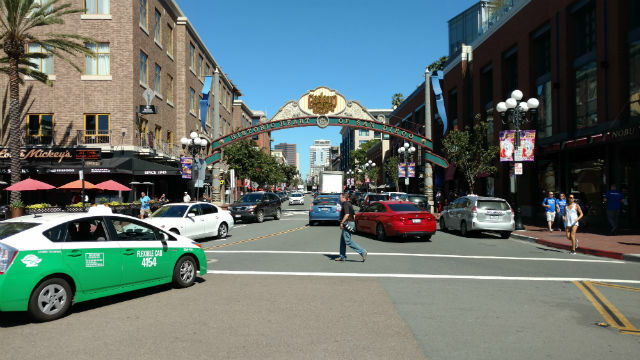 Police Thursday reached out to the public for help in identifying a man suspected of punching a woman in the Gaslamp District. The incident happened around 8:30 p.m. Monday near the intersection of Sixth Avenue and E Street, according to San Diego Police Department Sgt. Dan Brinkerhoff. A man was arguing with his fiance near the intersection when a woman intervened and confronted the man in an attempt to stop the argument, Brinkerhoff said. The woman said she was calling 911, then the man punched her in the face before fleeing the area, the sergeant said. The man’s fiance remained at the scene, but refused to provide any identifying information on the man, Brinkerhoff said. He was described as a 6-foot-2 black man around 50 years old who weighs around 245 pounds. He was last seen wearing a brown suit with a cream- colored shirt. Anyone with information regarding the identity or location of the man was asked to call Brinkerhoff at (619) 744-9510 or send him an email at dmbrinkerhoff@pd.sandiego.gov.